Christmas is going to be here in a number of weeks and I always thought a nice tradition would be to gift pajamas on Christmas Eve and wake up in them on Christmas morning, all snug and warm, cozy and comfy and ready to enjoy the festivities. They are a great way to give a practical gift, while having a little fun with designs and (of course) they make for great family photos! Well, now you can have even more fun, with FUNZEE all-in-one pajamas, which is honestly the best thing since sliced bread! They are warm, cozy and so soft that they feel like one, big, giant HUG! I couldn't wait to try mine on, this morning - and then didn't want to take them off at all, all day, except for the fact that it was truly far too hot in my apartment today and so I snuggled up in them a little while and put them up until the nights are a little cooler, which is probably going to be tomorrow, or at the very least, this coming week! That winter waits for no one! I can absolutely recommend FUNZEE for your holiday gift giving because no adult in their right mind should be without one of these! They are a little slice of heaven and feel like lying down in fluffy clouds! 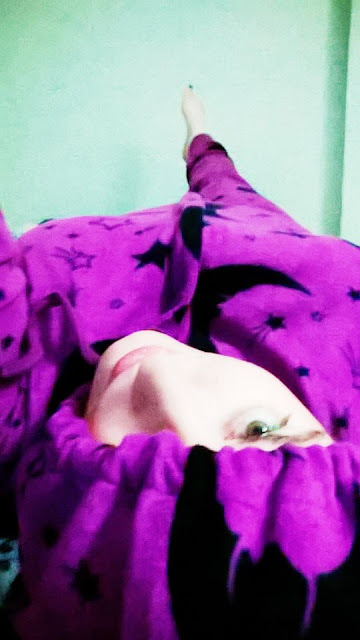 My family thought I had gone a little crazy when I told them I was going to get a onesie, but as soon as they saw it, they understood - they are just FUN FUN FUN and you can't get away from it!! The design I have is "Wizard", but there are loads of others available in different colors and designs, with feet or without and with hoods or without, and they run up to a large enough size that they even fit my over 6 foot tall frame and thus make a tall girl very happy, and warm! If you want to check out FUNZEE products, then you can find them HERE and follow them on TWITTER and FACEBOOK to keep up-to-date with all of their fabulous FUNZEES! FUNZEE pajama onesies make it effortlessly into our Holiday Gift Guide, this year, which you can follow by clicking the tab at the top of this blog, or Twitter with the hash tag #MGBHGG! Disclaimer: I was given a Funzee to try out and to share my honest and unbiased opinions! All opinions are my own and your views may differ! Thank you! Adult Funzee Onesie Pajamas are so much fun. I follow a musical group that has worn them in their Christmas videos and concerts. I think it is a great cute idea.